First a very important statement: We are not compensated in any way for promoting products by any manufacturer. If we speak highly of a product it is based on our experience and published facts. Choosing the right termite control product is just as important as choosing the right company to perform the work. Not all pesticides work the same, cost the same or produce the same results. A product called Termidor became available to us in 2000 which has faced some of the toughest tests in history. For over 11 years, Termidor has been tested in four states under the USDA-Forest Service ground board and concrete slab trials. At every application rate and every location, Terrmidor proved 100% effective. Termidor is the first termiticide to go through these requirements. The active ingredient in Termidor is fipronil and it works differently from other termiticide active ingredients. Most termiticides are repellents, which means their goal is to keep termites away from a treated area, rather than killing them (these repellent termiticides can also kill termites). However, since the termites are repelled when they come in contact or just before contacting the treated soil, the effect is less complete. In addition, the repelled termites will look for a new way to return to its food source. If they find a “gap in the treatment, they can return to the treated home or office. Termidor is non-repellent. Termites can’t detect it. Since they don’t know it’s there, they forage freely in a treated area not aware that they are contacting the lethal ingredient. 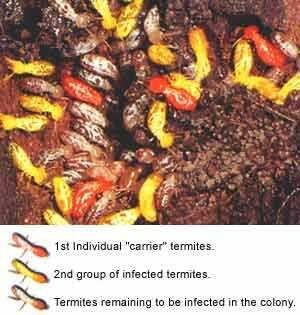 Like other leading liquid termiticides, Termidor is lethal to termites when they ingest it (which they do readily since they don’t know it’s there). But, unlike all other termiticides, Termidor is lethal by contact as well. Termidor works quickly and effectively. Government and other tests in the US and abroad have shown that in over ten years there have been no breaks or reduction in Termidor’s effectiveness. We are confident that you can count on many year’s worth of 100% termite protection when you contract Metro Guard Termite & Pest Control to treat your home with Termidor. Termidor is effective at very low application rates. Typically, when we apply Termidor, the active ingredient fipronil will be just 0.06%. That’s a lot lower than old-fashioned termiticides and less than most insecticides. Termidor also binds to the soil, so there’s minimal leaching through rainfall or irrigation. All new pest control products go through extensive testing by the U.S. Government. Metro Guard has been using Termidor since it was first made available to a select group of pest control companies. Cost – Termite baits are more expensive. The most widely used termite bait costs up to 5 times more than liquid termiticides. We have had the opportunity to review termite bait bids from national companies as well as local companies. In our experience these bids were substantially higher than our standard pricing which makes sense if the product costs more. Speed of Result – Because termite bait must be discovered by termites before itcan start working, there is not the immediate action that you get from liquid termiticide. Termites are still causing damage to your structure while you wait for them to find the bait stations and share enough bait to effect those still working in your home. What if the colony that finds your bait stations is not the one that is attacking your home? Termites are blind and constantly probe the soil for food sources. How long it takes them to find the termite bait is strictly a guess so be sure no one is telling you otherwise. Continuing Maintenance – This is another cost that you do not have with liquid. Each bait station must be continually monitored for activity and checked. This service has a charge that must be paid to continue that program. Maintenance fees can vary annually and can be quite high. Nothing after cancellation – When you cancel the maintenance contract with your pest company, they will no longer check your stations or add bait to the empty or “stale” stations. You can not buy the bait to place in the stations. We have been told of many cases where the pest company takes back the stations leaving you back to square one. With liquid solutions, once the treatment is applied, you own it. Extending the warranty is at your option and does not effect the treatment itself. One other misconception we have heard about baits is that they eliminate the termite colony. This has limited proof in real life trials and we contend that you will see that claim altered or “watered down” substantially if they aren’t doing that already. Termite baits can eliminate termites from your home but so can many other products for less money and less annual maintenance expense. We feel bait stations are a good alternative in certain situations but we are convinced that Termidor is more effective more often.